Australians love their contact sports, but many athletes are placing their oral health, and potential brain health, at risk by wearing over the counter mouthguard that may not fit properly. Mouthguards are vital equipment designed to protect the mouth and teeth of athletes in the event of a blow to the jaw or lower part of the face. According to some studies, wearing a properly fitted mouthguard may even help protect against concussion. Recent research conducted by the Australian Dental Association found that approximately ¾ of Australian adults a bit more than half (53.3%) of Australian children rely on over the counter mouthguards to protect them during training and events. Over the counter mouthguards may cost a bit less than custom fitted mouthguards from a dentist, those over the counter mouthguards offer little protection and may even be worse than not wearing a mouthguard at all. The Australian Society of Orthodontists reports that injuries to the mouth and jaw are some of the most common injuries suffered by athletes. Some of these injuries include tooth loss, breakage, or displacement, jaw fracture or dislocation, and lacerations, In those wearing braces, lacerations can be severe. While most people consider mouthguards primarily for contact sports like rugby and hockey, these types of injuries can also occur on non-contact sports and activities like skating, gymnastics, and cycling. As a result of these findings, Sports Medicine Australia and the ADA have worked together to develop guidelines pertaining to the use of mouthguards. Guidelines include recommendations that all athletes wear custom fitted mouthguards during training and games, and calling for coaches to maintain a strict no play policy for noncompliant team members. As important as mouthguards are for protecting the mouth and jaw, most people don’t consider mouthguards when considering risk of concussions and brain injury. However, custom fitted mouthguards may cut the risk of concussion by as much as half or more. According to a study in the May/June 2014 issue of General Dentistry, athletes were significantly more likely to experience concussion wearing over the counter mouthguards than custom fitted mouthguards. Six high school football teams were randomly assigned to wear either custom mouthguards or over the counter mouthguards. All of the athletes wore the same type of helmet. In the teams wearing custom fitted mouthguards, 3.6% experienced concussion, while 8.3% of those wearing over the counter mouthguards. 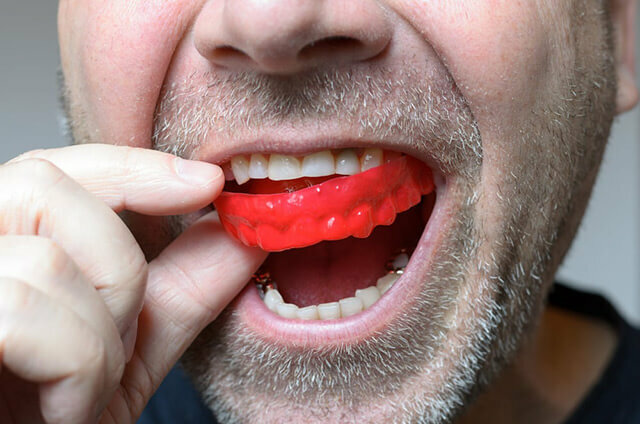 The dentists involved in the study say more research is needed into this issue, but the results clearly suggest that custom mouthguards can do more than just protect your teeth. Getting the right mouthguard is just the beginning. Proper care of your mouthguard can make sure it continues to protect you. Just like any other equipment, you should inspect your mouthguard before use for signs of wear or damage. Worn or damaged mouthguards should be replaced. Children and adolescents will need to have their mouthguards replaced from time to time as their mouths grow and change. Your dentist can advise you as to how often this should be done. Rinse your mouthguard after each use, or brush it with a soft bristle toothbrush and cool water. Store your mouthguard in a container with holes for ventilation and never leave it where a pet could chew on it or in hot conditions. Take your mouthguard when you see the dentist for thorough cleaning and inspection. To learn more about the importance of custom mouthguards or to have a mouthguard custom fitted, please call to arrange an appointment on 07 3278 0580 now.